We've already talked, at length, about the Colin Campbell e-mail controversy that broke two nights ago on Tyler Dellow's blog, mc79hockey. Qris already discussed how he felt that there was a poor media response to this story, that the wrong questions were being asked. I don't have much more to say on the subject. I do have something to say, however, about the even poorer response of Toronto Star reporter Damien Cox, who last night attacked the blogosphere on his Twitter account for no apparent reason. I'll admit that I haven't bothered to catch up on Cox's ongoing war with the blogosphere, as it doesn't seem worth the time. While some bloggers are simply fanboys that like to run their mouths, many (Greg Wyshynski, or locally, Mike Halford and Jason Brough) are now valuable voices in the hockey community. Even we here at Pass it to Bulis were one of the major voices in the Atlanta Thrashers/black players controversy, and we're proud of that. Yup. Just checking. Mc79 somebody's 15 minutes of fame just ran out. Buh-bye. Huh? When this popped up on my Twitterfeed, I was baffled. Yes, the Campbell story was beginning to peter out, but why revel in it? Tyler Dellow did excellent work in bringing this to light, and it's a shame it isn't getting a longer look. To me, Campbell's credibility should be zilch, and we should have Dellow to thank for the finishing move. But it appears the story is going to come and go, hardly denting Campbell's reputation, and Cox seems pleased the blogger didn't have an larger impact. In his tweet, he sounds like a cat with a bird in his mouth. Why so tickled? And no one cared. Nobody else even covered the story. And the NHL wasn't happy that The Star did. Today, the reverberations are different because local blogger Tyler Dellow took the evidence one step further, putting together some evidence on the players he believes Campbell was referring to in those emails, including Campbell's son. Now, suddenly everybody cares. When it was just about a fired ref, it didn't matter. It's an interesting comment on these media times, including the fact some "bloggers" are twisting this to suggest the "main stream media" is out to protect the establishment and figures in power. Why these people weren't outraged and up in arms when Cribb was writing his stories and The Star was publishing them is unclear. If you employ the logic of the bloggers, their silence was evidence that they were the ones protecting the establishment. Reading the tweet again in this light, Cox sounds glad Dellow will be returning to the obscurity of blogging simply because the Star's initial attempt to bring this story to light was met with shrugs. But Dellow reported a different story than Cribb at a completely different time. Things have changed in the NHL, especially when you consider that the scrutiny on Colin Campbell has increased drastically with the crackdown on headshots. Furthermore, Cribb didn't do the legwork Dellow did in determining who Campbell was referring to in many of the blacked out areas. Cribb's story is no less valuable; it simply isn't Dellow's story. It's not hard to see why this story is a bigger deal now than it was nine months ago. But, rather than reflect on this, Cox seemed downright annoyed a freaking blogger had gotten attention he felt his guys at the Star deserved. That's unfair. Dellow reported the right story at the right time. He did ample investigation; he released his name and stood behind his words; he backed up his findings; he reported the whole story with reason and tact. Dellow showed good journalistic ability, and he deserves a good pat on the back for some solid reporting. He doesn't deserve the needless disrespect Cox showed him. Cox's tweet started something of a Twitter flame war between he and the offended bloggers, who knew this was more about them than just Dellow. Cox tweeted occasionally, rousing rabble and being intentionally provocative. He came off like a bully holding a small child's forehead with his arm outstretched, chortling from his position of power. In the morning, he apologized for it and deleted the tweets. I'm glad, but at the same time I'm a little disappointed. As a blogger, it was frustrating to watch Cox kick sand in my face for no reason and part of me isn't satisfied. But, it would be petty for me to clamour for a pound of flesh now, after he effectively did the right thing. Such tough talkers. . .as long as they can hide behind anonymity. What? First of all, many bloggers release their names. I've never tried to hide behind anonymity. I wondered if Cox had the blogosphere confused with a message board he didn't like. People must have claimed that he didn't understand the blogosphere, as Cox then tweeted about the irony of such a claim when he blogs four times a week. My response to that? 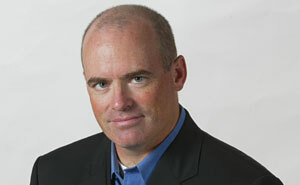 Cox doesn't really blog; he writes an online column for the Toronto Star. Cox is a professional writer, a place many bloggers hope to be one day but currently aren't. Most bloggers write for free, in between jobs they hate (it's true), and it's a completely thankless hobby. More often than not, bloggers spend an entire evening slaving over article, and it's a treat to get even one comment or retweet. This is not Cox's experience. Granted, he has his own challenges (editors, deadlines, accountability most of the time), but he's definitely not in a position to understand the challenges of most bloggers (finding motivation, finding an audience, finding time, finding original things to write about without press access). Unfortunately, he is in a position to mock them. Damien Cox has a national platform, and we saw last night that he occasionally abuses this platform to pick on those who don't. It's the equivalent of a professional hockey player heading down to his local church gymnasium and making fun of the amateur floor hockey league that plays there on Monday nights. Cox continued to provoke, seemingly motivated by little more than his own amusement. I don't know what other people's responses were to Cox, but I imagine some, at least, were as antagonistic as the tweet that had set them off. Cox reacted to some name-calling directed his way. Is name-calling really the best you folks can do? It is to yawn. People say that @damospin doesn't understand the Internet. I disagree, he's got trolling down to an artform. Very true. My impression of last night was that Cox came online to provoke and start a fight. He had very little motivation to do so short of a petty reaction to Dellow's original story. What frustrated me the most, of course, was that there was nobody to take my offense to over this--nobody to stand up for bloggers. Cox sat at his computer, taunting and jeering without remorse, behaving in much the same way he feels bloggers do. I don't want to use this as an opportunity to attack the mainstream media. This isn't about the whole shebang, really. It's just about Damien Cox acting like a jerk. I'd hate to make the same mistake Jeff Klein did when he called us "the blogosphere." We're one blog, and Damien Cox is one guy that clearly had a bad night. Still, this is about a larger issue. I suspect the MSM reaction to this story has been coloured by the fact it was broken by a blogger, and there's a kneejerk reaction on the part of the pros to distrust it. It's a sticky situation that typically doesn't come up because bloggers aren't given access to this sort of information, usually, because there's nobody to hold them accountable for what they do with it. The concern appears to be that, as independents, they might act in a manner untoward of representing a major corporation. But Cox just showed us that's a problem even within the mainstream media, and it's never right. Also: why are you not following PITB on Twitter? That's where the action is. I wouldn't worry -- you guys are winning both the battle and the war. The battle because pretty much everyone with an ounce of critical thought has panned not only Campbell, but also the tepid MSM reaction over this incident. You can see this right in the comment section of MSM news outlets, where they are allowed. The war because the type of people who are aware of what blogs are (i.e. people with Internet access and a modicum of interest beyond the boxscore) know where to get interesting analysis, that goes beyond "The players need to toughen up their special teams" or "Vigneault stated that the effort in the third period wasn't good enough." It's basic consumer economics. I started reading your blog because it was fresh and interesting. I had always been a fan of Tom Benjamin's blog -- before he technically had one -- because he actually delved into the science of the game (especially the effect of travel) in a way that slashed through the clichés and conventional wisdom that have been the bread and butter of sportswriters for generations, some years before "Moneyball" started the trend of critical thought in baseball. "Blogosphere versus MSM" is not a popularity contest to be won, it's market economics: people go to what satisfies their needs, and have been voting with their fingers and consuming blog products for quite some time. Note how every sportswriter has a legion of haters -- how many bloggers do? What's the point of hating on someone delivering analysis rather than trying to sell papers? Most of the attacks on "the blogosphere" have been strawmen (someone in the Globe and Mail implied that Dellow was the stereotypical dude-in-Mom's basement the other day) and laughed at as such by anyone who rises above Mr. Call-into-Dan-Russell-after-the-game-and-complain-about-a-lack-of-toughness. It is plainly evident that the sportswriting establishment is afraid of amateur blogs, which is why they have tried to co-opt them [and this is not a bad thing] either by hiring them, or by creating "blogs" of the type Cox writes. (Also known as nothing more than short columns). Keep it up, you guys are doing some solid work. And don't let this Campbell story die -- after Burrows/Auger and the Famous Disallowed Goal last year, I am as jaded as any Canuck fan. It's funny, because I think the MSM and bloggers can co-exist. I love what the Kurtenblog does at the Province; they straddle a brilliant line. I'd love to do PITB over at the Vancouver Sun. My major issue here is respect--there's no need to be disrespectful. It's ludicrous to assume we don't deserve respect simply because of the medium we use. I think you are close when you suggest Cox is upset that his fellow Star writer didn't get the same response Dellow did, but I think the truth is a little different. Damien Cox is upset that *he* does not get the same response Dellow did. Dellow posted something that was bound to be controversial, and attracted national media attention on his story. Cox has a habit of seeking to be controversial, and inevitably gets pissed when people begin to criticize him. His recent smear job on Jose Bautista, implying that the player was on steroids being the first off the top of my head. I think Cox is upset that he often ends up having to defend himself from character attacks, and as such felt it necessary to respond in kind when Dellow's story eclipsed in a matter of hours most of the coverage his own get. But what Cox fails to understand is that Dellow's story was well researched, well reasoned and designed to shed light on a very real situation. As such, the focus was on the story itself, not the author. Cox's controversial stories inevitably involve him throwing crap against the wall and hoping something sticks. They are not well researched, they are not well reasoned, and as a result, the writer himself becomes the story because people seek to understand why the writer is saying what he is. The difference between the two is that Dellow didn't put himself before the story. Still, it's a bit like Rob Cribb and Tyler Dellow -- similar original subject matter, different focus. here. Kudos to Garth Paulson for screencapping them at the right time. Methinks he spends a bit too much time at the Loose Moose, which results in these inflammatory late night rants on Twitter. Also, by the way, great article. I, for one, love my jobs, but I understand that's a luxury few have. Plus, I blog less than you do, so maybe if I hated my job more I'd have more to say. You're spot on that many bloggers hope to one day achieve what Damien Cox and his ilk have achieved. When you add to that Cox having access to a research staff that we don't, it's truly offensive that he and others can take their massive influence so lightly. They need to be more responsible with what they write and more respectful to people who are just trying to do what they get to do -- talk hockey for a living. They aren't? We're in the wrong business. The Bloggers disdain to conceal their views and aims. They openly declare that their ends can be attained only by the forcible overthrow of all existing mainstream media. Let the ruling classes tremble at a media revolution. The bloggers have nothing to lose but their chains. They have a world to win. Blogging Men of All Countries, Unite! I think you used the term "respected journalist" a little too loosely. Seriously though, I only ever get wind of anything Damien Cox related via Pension Plan Puppets, and what I've gathered is he is basically the hockey equivalent of Glenn Beck; He says whatever he has to, as loud as he has to, in order to drum up some cheap heat, and get more and more eyes on his stuff. And I guess to his credit it does work, regardless of how big of a douchebag he looks like. I think the silver lining in all of this is that clearly the MSM is feeling more and more pressure all the time from us "basement dwelling, sweat pant wearing, Cheeto eating" bloggers. If this was just a drop in the bucket I don't think it would have gotten much, if any play. But the fact that someone who has a legitmate writing job at a (questionably) legimate news outlet spends so much time trying to discredit guys like Tyler makes it pretty clear to me that Cox feels like the walls are starting to close in. If some random lawyer from Toronto can break a story like this open and have it catch fire so quickly, how much longer before Damein Cox is obsolete? It seems the last couple days I've been coming to this here site more and more. Keep up the solid work dudes. To be honest, I don't follow hockey "journalists." I read (with aplomb) PitB because it's interesting, insightful, and funny. The literal allusions (read: puns) alone make this blog worth reading. Don't get me wrong, I'm a huge Canucks fan, and I love anything regarding them. Hell, I'm reading CDC threads ALL THE TIME. Yet, the insight and humour (yeah, I went for the Canadian spelling) that I get from you blokes is bar none. Keep at it, and don't let the (possibly well built) man get you down. Also, I actually LOL'd at the thought of reading you in that rag they call the Sun. You deserve better than that. Sorry, anonymous. Blogspot can be a wicked fish. Harrison, I just wanted to say this is a great post. For the most part, I stay out of this fight because I hate making people like that feel like they are succeeding in whatever stupid goal they may have. I'm of the opinion that if we all ignore the problem for long enough, it will disappear. In saying that, I hate that Cox tries to play devils advocate on everything, all the time. How does that saying go? Something like "It is to yawn." Thanks for the kudos, Kevin. You're right, by the way. It's a problem that will eventually sort itself out. The cream always rises to the top. I've avoided this whole ball of wax thus far because I don't really feel that Cox's antagonism affects me. But I was online when it happened, and I was surprised at how angry it made me. I was more surprised that the outrage came from my status as a member of the blogging community. I try not to get self-righteous about being a blogger--I'm just a hockey fan who wants to be a hockey writer. But it was hard not to take umbrage when I felt attacked simply for wanting to write about hockey. When I woke up the next morning, I strongly felt I had to say something about that. Yesterday was a weird day because Qris wrote an even angrier post about the whole blogger/MSM thing. Between that one and this one, we briefly became crusaders for a cause. But in truth, normally we try to stay out of this fight. It seems more like politics than hockey, and I don't like politics; I just like hockey.